2009 October archive | YORK BLVD. What the hell did just happen? This website has a contentious bit of history with the world’s most famous taco truck. A couple of guys whose turn-ons include eating and customer service had some choice words for some food entrepreneurs after a missed connection in Eagle Rock. Scathing postings were exchanged, acrimonious comments were made to the articles, and many an L was capitalized. In short, much ado was made about nothing, and as it tends to do, life went on. Despite culinary awards, countless positive reviews from traditional media and bloggers alike, and wait times measured in hours, this family-owned business has the institutional memory of an elephant when it comes to slights. Over the weekend, this truck’s few detractors were devastatingly “served” via the hyperlink-laden lyrics to Cypress Hill’s “Rock Superstar”. I probably should just ignore this, and have been advised by those much wiser than me to do so, but alas, “just when I thought I was out, they pull me back in“. Search Kogibbq.com and look for their article titled Exorcism: The Purge. We haven’t linked to their post mainly because we’d like to encourage you to get an idea of the tenor of their entire site. People who display this much hubris on the internet open themselves up to so many different criticisms, it can be hard to focus on just one. In my estimation, the article’s most supercilious claim, almost lost in the jumble of hip-hopisms and disturbing juxtapositions of bodily fluids and cooking, is that the truck “takes risks going into neighborhoods that no other taco truck would touch”. I’m not quite sure how to address such an incorrect (and latently classist) statement but here it goes: I don’t follow this truck closely enough to know for sure everywhere it has plied its trade, but based on their schedule for this week, the “riskiest” neighborhood I see on the map is on the corner of our own York Blvd. and Eagle Rock Blvd. While the ARCO on that corner might be an adventure into the seamier side of Southern California for the Noveau Food Trucks, it’s not exactly a wasteland of mobile food. Scary as it may be, they would do well to chat with Leo, who has been working out of a taco truck (this far from the Alibi Room? Really?) for the better part of two decades. Pulling your head out of your…Twitter account…can do wonders for your perspective. Professional myopia aside, the article asks a good question: “What more can anybody want from us?”. Our answer: Be nice and move on. Believe me, we know how cool you all are. Heck, your linking to us probably moved us up in Google searches by a few notches. Still, even Jesus was nice to the little people lucky enough to catch a glimpse of him. In fact, he was so cool he didn’t even sweat the critics who wanted him dead. All we’re asking for is a baseline of maturity and professionalism. Ultimately, although the Street Code requires us to battle for our honor, we’re just a couple of bewildered “wankstas” content with cheap tacos and a “risky” neighborhood. That, and we’re out of commission since we may need physical therapy after such a severe serving. Peace out. 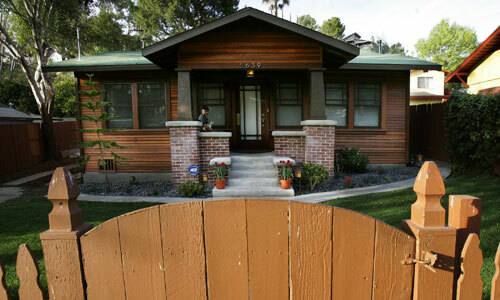 LATimes.com has a nice slideshow of local resident Alan Hopkins’ remodel of his 1920′s Craftsman home. What he learns is something most homeowners have already discovered: If you can afford it, it’s much easier to hire professionals. Still the results are beautiful. Unfortunately, the Times can’t seem to decide whether the Hopkins’ house is in Eagle Rock or Highland Park. I can think of some posters to the Mapping LA project who are breathlessly emailing the editor’s desk as you read this.